Rock for Learning features THE KIN Cultivating a Better World with Kinship - Get on board! Rock for Learning celebrates 15 years of sharing great music and good causes! Get on board with The Kin! "Everything's Changing" as The Kin "Get On It" bringing waves and bonds of kinship with new sounds and new friends stealing hearts on their "Thick as Thieves" tour, including opening for Pink and Coldplay in various cities this year. From Isaac Koran's didgeridoo and brother Thorry's harmonies to keys and "Shakerleg's hands on drums, this trio of The Kin share a uniqueness of indie-rock like no other. Vocalist/guitarist Thorry Koran shows that touring takes a lot of energy, and shares that although traveling is one of the biggest challenges of being a professional musician, "The greatest reward is the relationships with the people" as they meet many of their fans and friends along the way sharing love and kinship. Their fans are truly passionate, coming from near and far away and singing along beautifully in detailed lyrics, including every word of their song "Mary". 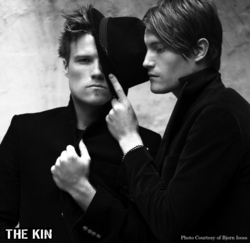 The Kin never fail to set an intimate bond with their audience. Spread the love and keep the kinship going with The Kin and Rock for Learning to cultivate a better world "Together"! Download new music at i-tunes and join in on the kinship! Looking forward to more with The Kin in 2015! See videos of their new music and linK in at theKin.com. THE KIN - "EVERYTHING'S CHANGING"
All the way from Adelaide, Australia, to the mecca of New York City, it's THE KIN with the melodic guitar acoustics, keyboards and vocal harmonies of brothers, Thorry & Isaac Koren, with a most unique drummer, “Shakerleg”, who plays a drum kit solely with his hands. Vocalist/guitarist Thorry Koren shares the significance of The Kin, "The Kin means family, clan. The Kin is always writing about that, the coming together as one, the collective. I think that is what true family is about - not just being blood related; there are deeper connections. Music does that, brings people together, and I hope we can be part of that." Even though they had harmonized together as kids, Thorry and Isaac originally had separate music projects. Keyboardist/vocalist Isaac Koren shares, "The Kin started by accident. We needed a gift for a special person and decided to write a song together. It was good, and that's what eventually became The Kin." In live performance guitarist/vocalist, Thorry Koren exudes deep seeded emotion from the struggles and tribulations of life as it comes through in his playing. Keyboardist Isaac Koren brings it together with beautiful harmonies and his soothing vocal tone. Listen and join The Kin and support them in the efforts to help the troubles of violence and poverty in Darfur, Sudan, by watching their video "Call It a New Day" on their website www.TheKin.com. Each time the video "Call It a New Day" is viewed online, thirty-five cents will go to help the crisis in Darfur. The goal is to reach a million viewings of the video. Also collaborating with The Kin is artist/painter Patrick Madden, who has created a series of paintings to their premiere album “Rise & Fall”, all proceeds from his Rise & Fall series will help the crisis in Darfur. See PatrickMaddenPainting.com, and please spread the word of great art and music. Visit TheKin.com & MySpace.com/SaveDarfurCoalition and learn more about it. Copyright 2001-2017 New Moon Publishing & Consulting All rights reserved.